Tektronix, Inc., the world's leading manufacturer of oscilloscopes, today announced the OM4106D Coherent Lightwave Signal Analyzer – the first coherent test system with 33 GHz bandwidth support. This industry-fastest performance is achieved through tight integration with the DPO70000D Series oscilloscopes for exceptional real-time performance along with purpose-built algorithms with best laser phase tolerance, no pattern length limitation and insightful displays for fast analysis and debugging of high-performance optical designs. Driven by the explosive demand for high-quality video and other content, long haul networks are struggling to meet bandwidth demands. However, providers are reluctant to spend billions on new fiber deployment and are turning to modulation techniques that will provide more capacity on existing fiber. Coherent lightwave signal analyzers play an important role in efficiently moving higher-speed designs from laboratories to production, and as speeds increase test equipment must keep pace. Traditionally, optical modulation analyzers have been designed to work with a range of oscilloscope models and types. 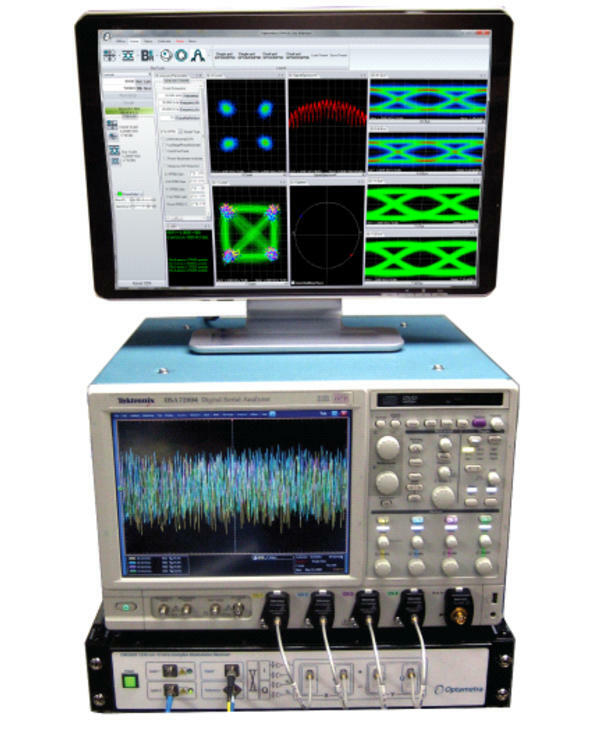 The OM4106D is the first to be tightly integrated with a high-speed oscilloscope giving it the performance required to test the fastest coherent lightwave systems on the market. The DPO73304D oscilloscope delivers 33 GHz realtime bandwidth together with 100 GS/s sample rate performance across two channels or 50 GS/s across four channels. The oscilloscope also features a new DataStore Public Interface that provides up to 2x the data throughput from digitizers to the MATLAB application processing the OM4106D algorithms for analysis. In addition to industry leading performance, the OM4106D includes comprehensive analysis software for coherent modulation analysis including Q Plot, Eye Diagrams and effective bit error rate (BER). This is supplemented with deep levels of debugging functionality and a diverse set of plots/results to help users quickly identify root cause issues in their designs. Also available is a complete calibration and evaluation system for third-party receivers, enabling easy integration into an existing optical research laboratory environment. The ability to achieve consistent measurement results from a calibrated, proven analysis tool helps to improve the transition from the design lab to manufacturing floor.